My last blog on 13th February reported that the case of Selahattin Demirtas, the former co-chair of Turky’s HDP (Peoples’ Democratic Party), had been adjourned until 11th April. With his parliamentary immunity removed, Demirtas faces many separate indictments and trials under Turkey’s Anti Terror Laws. In February, before a court in Akara he had eloquently conducted his own defence, (see previous blogs) but as his request for bail was refused, he remained in custody at Evirne prison. This third, most recent hearing lasted 3 days and again Demirtas defended himself. Once more, the court decided to adjourn the case, this time until July 18th, and his detention was continued. Again, just as in December 2017 and February, no foreign observers were allowed inside the court. However international observers like myself never give up. Along with many other European lawyers and Human Rights activists, also diplomats from the embassies, I am hoping to observe this latest trial that Demirtas faces. I will be in Istanbul on Monday 16th April to attend the Silivri prison court. There Demirtas will answer to further indictments, accusing him of creating propaganda for terrorism, organising a terrorist group; all these accusations based on skewed interpretations of his speeches made inside and outside parliament in recent years. There are many trials going on against Demirtas, all dealing with propaganda, speeches. All these appear to be part of a conspiracy to silence Demirtas as an Opposition leader. The pro-Kurdish party, the HDP, see this scattering of cases to many different Turkish cities as a means of spanning out the hearings so as to keep their former leader in prison for the longest possible time. On Monday, Demirtas stands trial with the MP for Ankara, Siri Sureyya Onder, at the Istanbul 26th Assize Court (sitting in the Silivri prison complex). He is being tried on the grounds that a speech he delivered at the Newroz celebrations in Istanbul on 17th March 2013 was “terrorist propaganda”. It is vital that we international observers attend the trial, for even if we are banned from observing the hearing, we can report on the state of the justice system. For a trial to be fair, it must be open to the public. This is going to be a dramatic week, especially coming after the bombing of the chemical weapon sites in Syria, and the controversy surrounding Turkey’s attacks on the Kurdish people’s protection units, the YPG and the YPJ, that are viewed by President Erdogan and his AKP (Justice and Development Party) as terrorists. Also, since we will be in Istanbul, my UK solicitor colleague, Ali Has, has petitioned the Turkish Minister of Justice and the Governor of Silivri Prison for permission for us to visit the former student, Ilhan Comek. IIhan has been in prison for the last 21 years and has been transferred to Silivri. Ilhan was arrested in 1996, when he was a 20 year-old Kurdish student studying for a psychology degree at a university in Istanbul. He has never been involved in terrorism, but was charged under Turkey’s anti-terror legislation on what appears to be very thin grounds. The charges were based mainly on the fact that Ilhan was seen having tea with a young woman who happened to have a cousin in the terror-tagged PKK (Kurdistan Workers’ Party). She was a girl he barely knew, but they had mutual friends. Ilhan is one of over 70,000 mostly Kurdish students who have either been convicted or are in jail on remand, charged with terrorism offences. I was an observer of Ilhan’s trial last year (he appeared via video link) when, to the great distress and shock of his parents, friends, supporters, he was given a life sentence. He will not be free until he is 51. 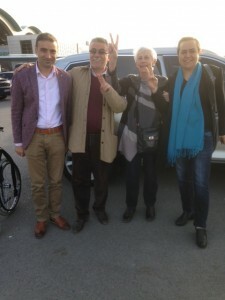 Ali Has and myself hope to see Ilhan during our visit to the Silivri Prison complex but that will be entirely dependent on the Turkish authorities. Meanwhile, repression against opposers of Erdogan is increasing. Only last week, several HDP members, independent journalists, students and others protesting against Turkey’s attacks on Afrin have been detained. It is in this tense and polarised environment that Monday’s trial of Demirtas takes place.